The teacher asked the students to write hiragana on my first Japanese class. He said this is the basic of learning Japanese. He is right. Without learning the writing system in the first place, I would have difficulty to continue my Japanese learning journey on my own. The reason is I would have difficulty to look up in a dictionary for new vocabulary. For Chinese language, 汉语拼音 (HanYu PinYin) helps a person to look up a new word in a dictionary and learn, though it is not the writing system. There are three types of writing systems in Japanese language — hiragana, katakana and kanji. Both hiragana and katakana are the lists of Japanese syllables. If you want to be fluent in Japanese (or any other languages), please learn the writing system at the beginning. With today’s technology, you can use the online dictionary or apps to find the meaning of a new vocabulary. In this way, you can always learn and continuously improve. Hiragana is more commonly used than katakana. Katakana is only used for loanwords (mostly from English words) and sound mimics. Kanji is the Japanized Chinese characters. In the past week, I used one hour to revise hiragana, five hours for katakana and zero hour for kanji. Zero hour for kanji? Yes, lucky for me, Chinese language is my mother tongue, thus writing kanji is the same as writing any Chinese characters. The only problem for me is to know how to read (pronounce) the kanji because the same character in kanji and Chinese language is pronounced differently. If you have noticed, I use kanji in my post title (It is not Chinese character!) as a way of revision. The same character, 二, is read ni (に) in Japanese language and er in Chinese language. If both languages are foreign to you, I would suggest you not to learn both languages at the same time because you would be confused. As for hiragana, I have always been practicing writing hiragana repetitively, even when I am not learning Japanese. Below is the figure showing my hiragana writing, with two circled syllables that I have forgotten how to write without referring to any references. Thus, a quick revision is sufficient for hiragana. The circled syllables are the two syllables that I have forgotten. 1. When you learn a new language, start from the writing system. 3. Use the language in your daily life to reinforce what you have learnt. 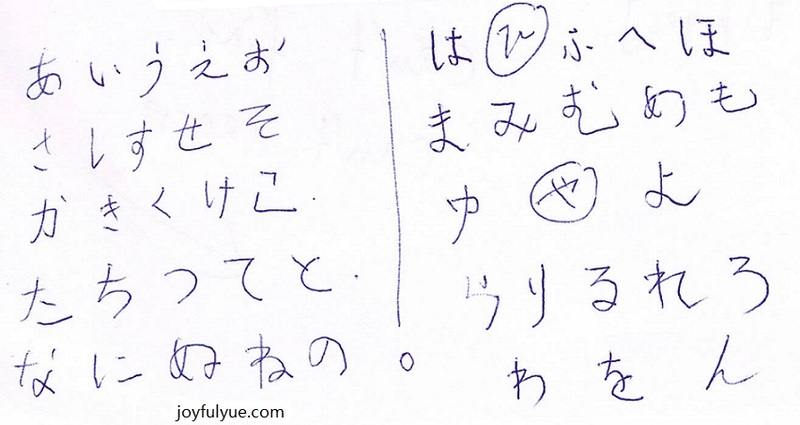 By Wendy in Learn Japanese on 01/12/2013 .